The reported survival times for GIST patients vary widely depending on stage of disease , the era reported [16–18] and the landmark used for measuring survival. 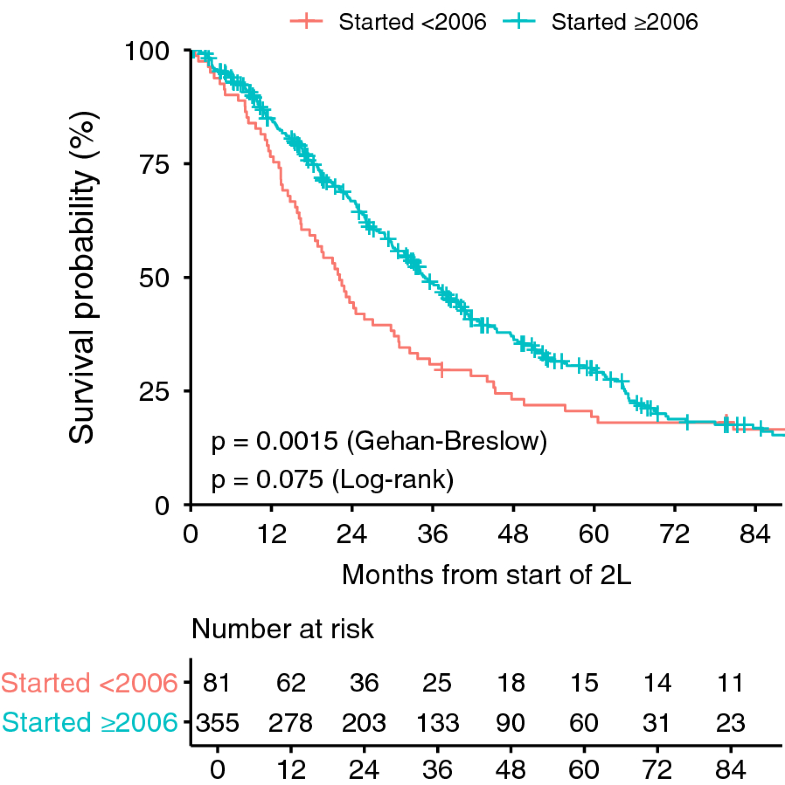 The extent of improved survival due to individual lines of TKI therapy is unclear. For example, the early imatinib metastatic studies were enriched for patients with bulky disease . Survival in those studies may have been shorter than for metastatic disease patients diagnosed currently with less advanced/bulky disease. 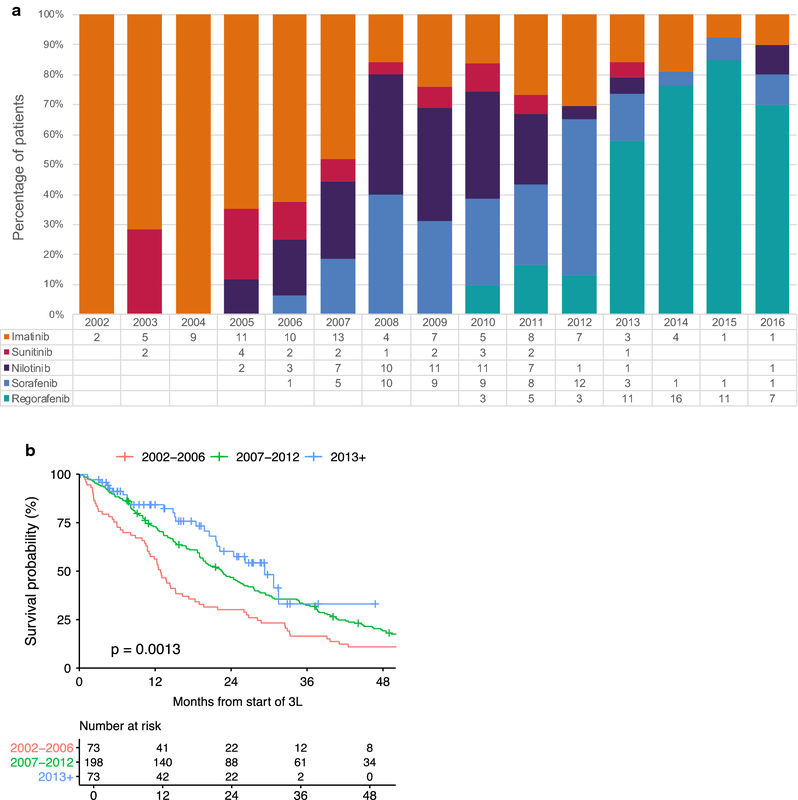 Imatinib improves survival when given as adjuvant treatment  and the current paradigm of surveillance during and after adjuvant therapy likely leads to the earlier detection of recurrent disease. In addition, the OS reported for the early imatinib studies may not fully capture the additional survival benefits due to use of salvage sunitinib and regorafenib. While sunitinib was initially reported to increase OS compared to placebo , the phase 3 study design which allowed crossover from placebo to active drug upon progression, has obscured the actual survival benefit of this agent . The survival benefit of regorafenib is also unclear . 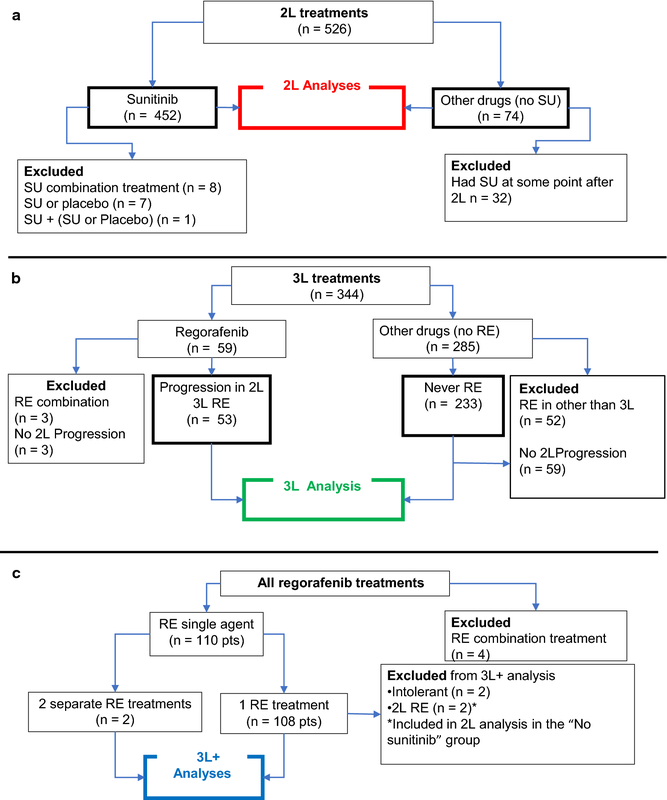 Notably, in the phase 3 regorafenib vs. placebo study (GRID), the OS benefit of regorafenib was not identified at the time the results were published in 2012  potentially due to the high rate of cross-over from placebo to regorafenib. Therefore, the impact of 2L sunitinib and 3L regorafenib on the OS of advanced GIST patients remains unclear. For 3L treatment of patients reporting progression in 2L, 53 received regorafenib and 174 never received regorafenib. 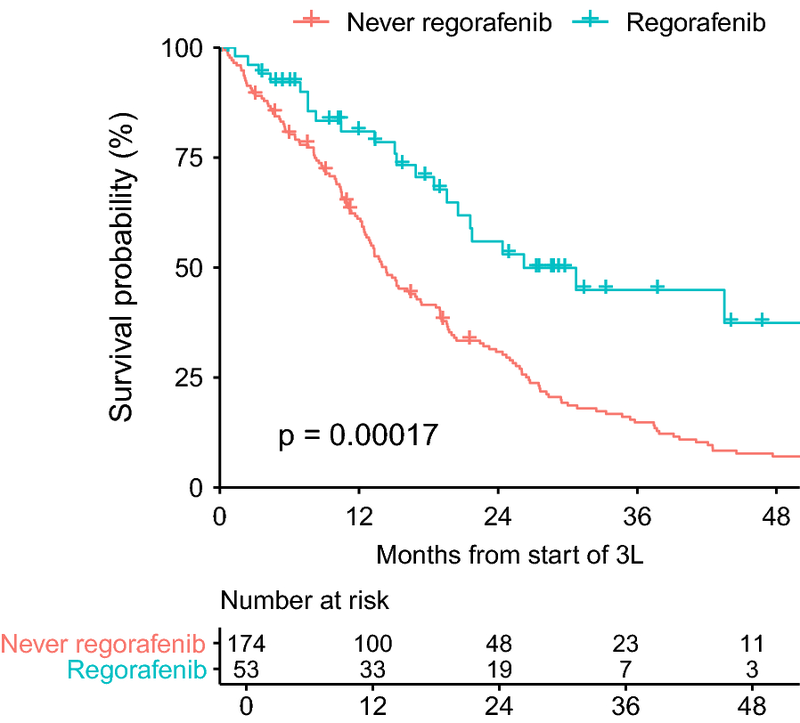 Between these groups, regorafenib treatment compared with never receiving regorafenib was associated with improvement in OS by 11.9 months (26.2 months vs. 14.3 months, respectively, p = 0.0002, HR 2.231, CI 1.45–3.43) (Fig. 5). The most common drugs used in 3L in the no regorafenib/progressed in 2L group were imatinib (n = 50, 28.9%), nilotinib (n = 37, 21.4%), sorafenib (n = 36, 20.8%) and sunitinib (n = 10, 5.8%). The use of sorafenib and nilotinib was likely influenced by ongoing phase 2–3 studies of these agents prior to the approval of regorafenib [30–33]. Since it has been suggested that surgery for patients with metastatic GIST may be beneficial [34–36], we investigated the impact of surgery within 2L and 3L treatments. Given the limitations of retrospective data in evaluating surgical benefit (see Surgery and Surgery Limitations in the “Discussion” section), the first question that we were interested in was whether surgery was equally balanced in the different groups within our study. 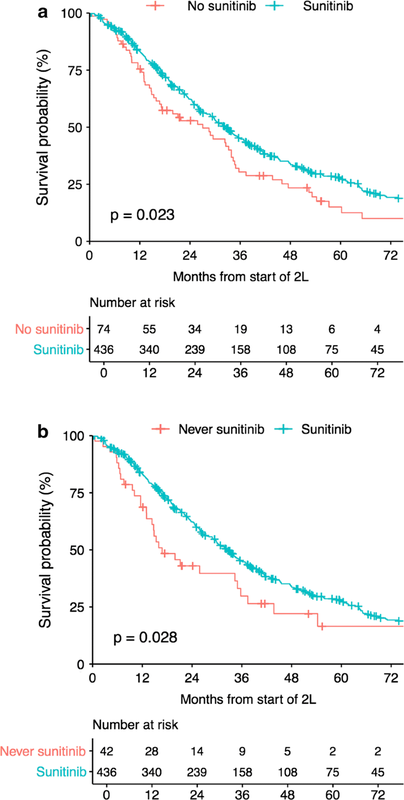 In 2L treatment, surgery was well-balanced with 14.5% of sunitinib patients having surgery within 2L and 9.5% of patients never receiving sunitinib having surgery. The percentage of patients have surgery in third line treatment was also well-balanced with respect to 3L treatment start date categories (2002–2006 12.3%, 2007–2013 6.6% and 2013+ 9.6%) and patients having 3L regorafenib (9.9% had surgery) or never having regorafenib (7.7% had surgery). 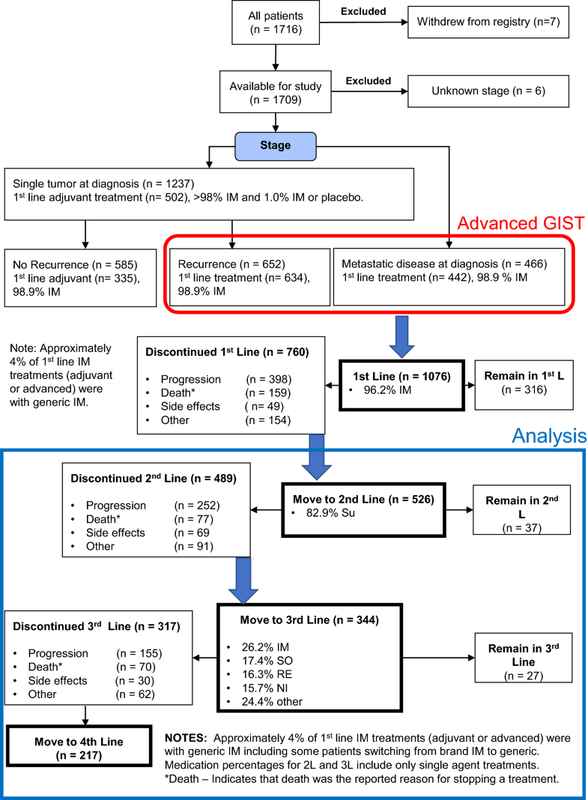 The limitations of retrospective data to evaluation surgical benefit for metastatic GIST have been well-described in the literature [34–36]. A primary concern is that healthier patients are often better surgical candidates. In addition to these well-described limitations, the data structure in the LRG registry was not designed to identify generalized progression versus local progression or stable metastatic disease at the time of surgery. Given these limitations, we can only state that patients that had surgery in 2L or 3L had longer OS than those that did not, but we cannot conclude whether this was due to surgical benefit or because they were healthier patients. Failure to obtain clear margins in 2L or 3L surgery was also associated with significantly worse OS. Since the term “clear margins” is more appropriately used to describe surgical margins after primary tumor therapy, it is necessary to consider how patients might interpret it in the context of 2L or 3L surgeries. In this context, it is more likely to be interpreted by patients and registrars as no evidence of disease after surgery. Interestingly, when given the choice of Clear Margins, Not Known or No Clear Margins, Clear Margins and Not Known grouped closer together (especially in 2L) and the No Clear Margins patients had clearly worse OS. 13569_2019_114_MOESM1_ESM.docx Additional file 1. Additional tables.